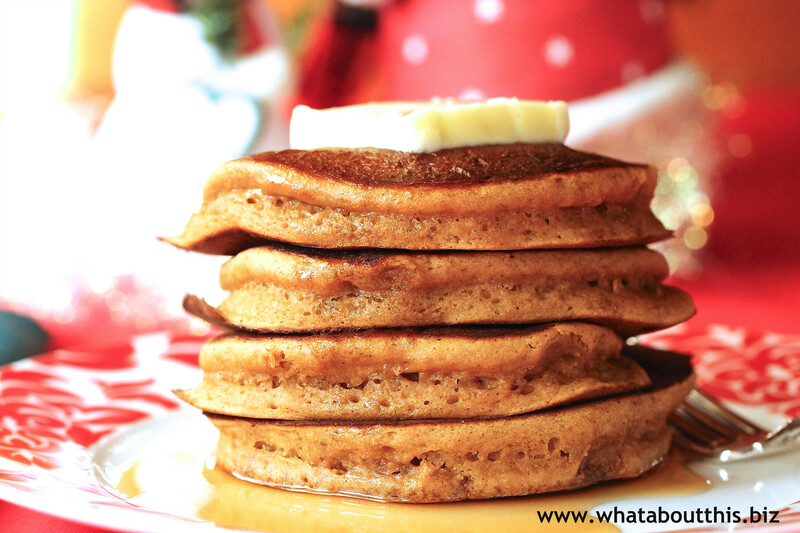 Gingerbread Pancakes With Maple Cream | What about this? Take a good look at these lightly-spiced caramel-colored pancakes. Better yet, click on the photo to enlarge it. They appear deliciously light and fluffy, but something is missing. Butter? No. Syrup? No. Maple Cream? Yes! I should have whipped the cream before I cooked the pancakes, because resisting pancakes hot off the griddle is obviously not one of my strengths! 1. Preheat an oven to 250° degrees F.
2. Position a rack in the center of the oven. Place an ovenproof dish on the rack. 3. In a large bowl, beat the molasses and oil, by hand or with an electric mixer, until well-blended. Beat in the eggs, one at a time, then add the milk. It is important to stir all the way to the bottom of the bowl to make sure all of the ingredients are brought together. 4. Sift the all-purpose and whole wheat flours, sugar, baking powder, baking soda, salt, ginger, and cinnamon into the egg mixture, and beat until just blended. The batter will be slightly thick and have a rich, dark caramel color. 5. Heat a griddle or nonstick skillet on medium-high heat until a few drops of water skip along the hot surface. Working in batches, measure out a scant 1/4 cup batter for each pancake. When cooking more than one pancake at a time, pour the batter so that the pancakes do not touch. Cook the first side until the edges begin to dry and bubbles begin to appear on the top surface. Turn and cook 1 minute on the second side. 6. Place in the oven on the preheated dish to keep warm. Repeat with the remaining batter. Serve the pancakes hot with Maple Cream. 1½ tablespoons pure maple syrup, at room temperature. In a chilled bowl, whisk the cream until it just begins to form soft peaks. Drizzle in the maple syrup, continuing to whisk until soft peaks form and begin to hold their shape. Cover and chill until ready to use. 1. I used dark molasses, because that’s all I had in my pantry. Peggy Trowbridge Filippone of About.com says, “Although light and dark molasses are interchangeable in recipes, be aware that using the dark will intensify flavor and slightly darken the end product and vice versa.” Indeed, my pancakes were slightly darker in color than those in the cookbook photo, but they had a nice molasses flavor to them. 2. It is better to measure out the oil first instead of the molasses. By doing so, the oil will coat your measuring cup, enabling the molasses to pour out more easily. 3. Keep an eye on these pancakes as they are cooking; they have a tendency to brown quickly, due to the sugar content in the molasses. It would be wise to start at a lower temperature than you normally would for pancakes and then adjust the the heat accordingly. My husband liked the darker pancakes, because they had more intense flavor. 4. The gingerbread flavor in these pancakes is very subtle. If you want a spicier gingerbread flavor, add more spice. 5. If you like thinner pancakes, thin the batter with a little bit of milk.